In this edition John answers questions on Oxbridge, the first four-point tries by major nations, Dr. 'Joe' Kraefft, 1995 Rugby World Cup survivors and All Black boxers. Nearly 600 Rugby Blues have won rugby international caps - a figure that excludes the small band of international players who missed their Blues while in residence. So nearly 500 Blues were or became internationals in the period up to 1969 (with fewer than 4% being capped outside the Home Unions - in those days overseas Blues, especially those from South Africa, tended to be capped by England or Scotland). Nearly 100 Blues since 1968 have become international players, with a considerable rise in overseas players to more than a third (including the first Japanese and Canadian Test players). Several players have been counted twice: for instance George Aitken (Oxford) was capped by NZ and Scotland; "Johnnie" Wallace (Oxford) by Australia and Scotland; and post-war Barry Holmes (Cambridge) was capped by both England and Argentina in 1949, while more recently Ian Williams (Oxford) played for both Australia and Japan in Tests. Each was capped after securing his Blue. 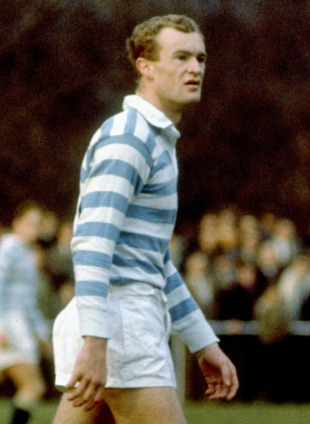 Gibson was such a sensation in his first match in December 1963 that he was then drafted into the Ireland side for his debut in February 1964 in a famous 18-5 Ireland win against England at Twickenham. The four-point try came into operation from 1st September, 1971. The first such try scored in a major Test was by France's Jean-Claude Skrela against Australia in Toulouse in November 1971. Dr Donald Frederick "Joe" Kraefft was born in North Sydney on 20th July 1922 and died on 14th November 2010, aged 88. He was educated at Shore Grammar School and made his debut in senior club rugby with Sydney University, where he was an engineering student, in 1941. He represented New South Wales and made his Aussie Test debut alongside Nick Shehadie (also on Test debut) against New Zealand at the SCG in 1947. On the 1947-48 tour of the Third Wallabies to Britain, Ireland, France and North America Kraefft formed the first-choice second-row with Graeme Cooke for all five of the Tests played, the versatile Shehadie moving to prop. France alone of the Five Nations crossed the tourists' line in the Tests. It is believed that there are seven survivors of that Wallaby tour: Sir Nicholas Shehadie, Terry MacBride, Eric Tweedale, Mick Cremin, Dr Max Howell, Arthur Buchan and Kevin Bourke. Andrew Mehrtens, New Zealand's first five-eighth in the 1995 Rugby Wiorld Cup, has been playing for Béziers this season in France's Fédérale 1 - the equivalent of third division rugby over there. (There are 14 clubs contesting the Championnat in the top division and 16 in the Pro D2). Jonah Lomu, who was the player of the tournament in 1995, appeared in the squad list for Marseilles (one league lower in Fédérale 2) at the beginning of the 2010-11 season. Now that rugby is a professional sport, instances of dual internationals (or high achievement at two major sports) have become increasingly rare. All Black non-Test players who achieved boxing honours include B V McCleary, a member of the famous "Invincibles" who toured Britain, Ireland, France and North America in 1924-25. He won the New Zealand heavyweight and light-heavyweight titles in 1922 before turning professional. J T Burrows, A G McCormick (father of Test full-back Fergi) and W L Elvy were other non-Test All Blacks who were distinguished amateur boxers. The only Home Union international to box professionally was the former Wales centre Jerry Shea who operated at the welterweight and middleweight divisions. His most famous opponent was Ted "Kid" Lewis, the former world welterweight title-holder. The best Olympic boxing achievement by a rugby union international was the Silver medal won by R L "Snowy" Baker as a middleweight at the 1908 games (where he was beaten by the England Test cricketer J W H T Douglas). Baker had gained two rugby union caps for Australia against the 1904 British/Irish Lions.